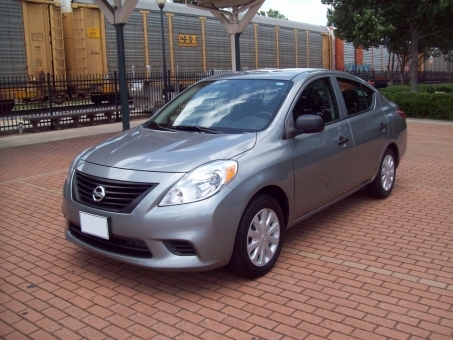 2014 NISSAN VERSA S 5-PASSENGER 4-DOOR SEDAN - ONE-OWNER PRE-OWNED VEHICLE!!! This vehicle comes powered by a 1.6L 4-Cylinder engine along with an automatic transmission. colored in an Ash Metallic Finish -K36- over a Black Cloth Interior. Other options and features include: A/C, Tilt Steering, Rear Defroster, Keyless Remote Entry w/ Alarm, Factory AM/FM Stereo w/ CD, Dual Front and Side Airbags, Traction Control + ABS, Child Seat Anchors, Floor Mats, and 15-inch Steel Wheels on matching Yokohama Tires. This vehicle has NEVER been smoked. At Japan used cars, used cars dealers, importers and individual buyers can buy any kind of used vehicles from any Japan car manufacturer at reasonable prices with full trust. Our used cars auctions provide thousands of cars and buyers can choose their dream cars from a huge variety of Japanese SUVs, Japanese sedans, Japan trucks, Japan sports cars, Japan coupes or Japan pickups. Satisfaction is guaranteed for all who choose to buy used Japanese cars, certified used cars, used cars by owner, pre-owned Japanese cars, second hand Japan cars, used cars online, etc. from the comfort of your home or office, using our handy and transparent bidding system and competing with other potential buyers interested in Japanese used cars. Join us and enjoy accessing the auctions on Japanese used car at once and find vehicles of your choice in an instant!